Based on feedback received from troops in the field, comfort was the most desired quality and Belleville engineers developed their proprietary VANGUARD running shoe construction. Now made specially for women for the Army's new ACU OCP uniform, the FC390 expands the market of this popular boot. This boot was constructed with an athletic feel in mind for top performance in hot weather environments. It features a lightweight upper constructed from 100% pure leather cowhide and ballistic nylon. A polyurethane midsole provides ample cushioning from heel and toe shock. The FC390 is constructed on a VIBRAM Sierra outsole that features a large lug pattern for all around traction. The F390 is battle proven and this Belleville boot still remains one of the top sellers today. 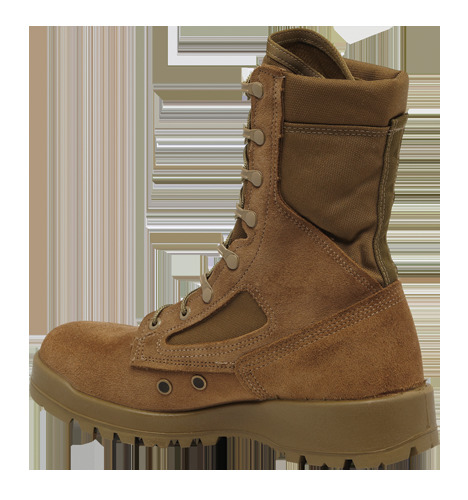 This boot is approved for wear with the Army Combat Uniform OCP and is Berry Compliant.